Fear not, Mitt Romney supporters, your candidate will coast to victory today—if, that is, you put more stock in woodland creatures than in Nate Silver. Gnocchi, a squirrel who “predicted” Barack Obama’s 2008 primary and presidential wins by choosing one bowl of peanuts over another, chowed on Romney peanuts last month. The Washington Redskins lost at home to the Carolina Panthers on Sunday, which means, according to the “Redskins rule,” that the incumbent party will lose the electoral vote. And Brietbart notes that since 1860, Republicans have won every presidential election that fell on Nov. 6. The Obama campaign, for all its devotion to data, hopes to counteract these trends with a few superstitions of its own. After Obama’s strong performance in the second debate, Jon Favreau, David Axelrod, David Plouffe, and Jay Carney memorized the way they arranged their seats at dinner and replicated it for the third debate. Favreau and two other staffers, Ben Rhodes and Bobby Schmuck, have pledged not to shave their beards until the election is over. And Axelrod and Plouffe wore matching ’08 campaign fleeces yesterday. Even Obama himself is superstitious. He ate steak and potatoes for dinner before the second debate, and since he performed well that night, he ate the same meal before the third debate. Most famously, he plans to play basketball today, just as he did prior to the 2008 general election and every primary but one—New Hampshire, which he lost to Hillary Clinton. Romney, on the other hand, doesn’t seem to have such superstitions (or if he does, he hasn’t revealed them to reporters). Then again, given how his last presidential bid turned out, he’s probably still be in the process of developing them. 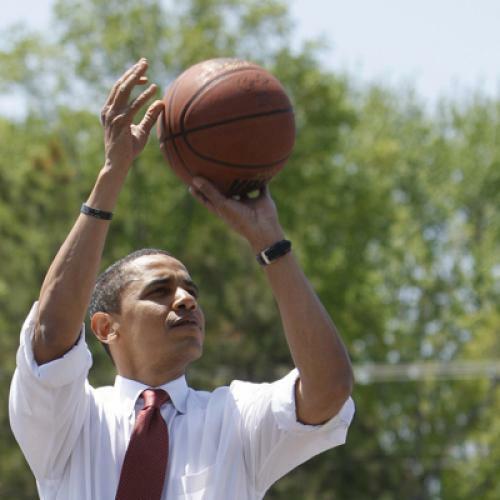 Who knows—maybe, four years from now, President Romney will swing by Wendy’s for the very same reason that Obama's shooting hoops today. Or maybe he'll never eat at Wendy’s again.